Today’s Productivity Boosting Tip: Cross It Off! Today’s tip: Cross it off! The final action of every task should be crossing it off your list. Make it a point to stop and enjoy the ritual of crossing off or checking off tasks before starting your next action. * Make “Create to-do list” the first task on your list, allowing you to start your day on a positive note with a completed task. There’s no greater satisfaction than checking a completed item off your to-do list. It’s a symbolic victory of your productivity, and it provides motivation for your next task. Celebrate your success — check it off! Looking for an attractive planner to hold your to-do list, choose our Coastlines weekly planner at daytimer.com. 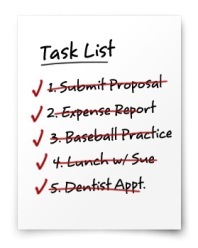 It may seem silly but sometimes if I have completed a task that came up at the last minute or complete a task I forgot to write down, I will write on my task list AFTER it is completed and check it off. This gives me a diary of what I did but also that satisfaction of physically checking it off as done.